Neck injuries are very common in personal injury cases and seem to be a part of every accident case we handle in Massachusetts. We’ve all heard the common term “pinched nerve”, but what has occurred is cervical radiculopathy. Cervical Radiculopathy is the term used for radiating pain, numbness, tingling or weakness caused by compression or irritation of the cervical nerve roots. Remember there are seven cervical vertebrae that support the head and enable it to have a wide range of movement. These nerve roots exit the spine and pass through what are called the foramina. The foramina is simply an opening or passage by which the nerve roots exit the spine and branch out to the shoulders, arms, hands and fingers providing sensation and motor control. When the vertebrae are compressed or irritated and constrict the foramina thereby pressing on the exiting nerve roots, the result is pain, numbness, tingling or weakness along that particular nerve path. Depending on the location of the compressed nerve, a variety of areas of the body can be affected. For example nerve root compression at cervical disc number 6 (“C6”) can cause radiating pain in the biceps, the wrist, the thumb and the index finger. Compression at C7 can affect the base of the neck, the triceps and the middle finger. Compression at C8 can affect the fourth and fifth fingers and can impair the ability to grasp or grip objects with the hand. People involved in motor vehicle accidents are very susceptible neck injuries, whether it be a head-on, rear-end or T-bone / side impact collision. The force applied in a collision can snap the head in an unexpected direction and the result can be traumatically painful. Imagine you’re at an intersection in a busy part of Boston waiting to merge into traffic. 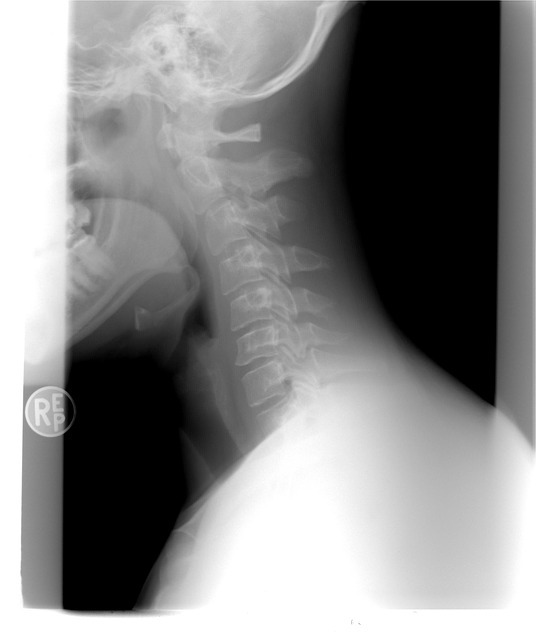 Your head is in full cervical rotation, turned a full 90 degrees as you watch for an opening. Without warning you are struck from behind by another motorist. Your head snaps back from the impact. The violence of that movement is almost guaranteed to cause disc problems in the cervical spine. A herniated disc and cervical radiculopathy can easily result. This is what happened to one of our clients. She was a very active fifty year old, who was stopped at a stop sign waiting to merge onto Route 9 in Framingham. With her head turned almost 90° to the left her vehicle was struck without warning from the rear resulting in a very violent and abnormal snapping of the head. The impact was in the 25 to 35 mile per hour rang, but the awkward position of her body resulted in a herniation of the disc in her cervical spine. Cervical Radiculopathy can also be caused by a work injury. Jobs that require a lot of heavy lifiting or repetadive movements can lead to cervical injuries. For instance, a recent client of ours was loading a truck at a warehouse in Massachusetts and suffered a very serious back and neck injury. This client was later diagnosed with a herniated disc in the cervial region and cervial radiculopathy. He sufferd pain radiating down into his shoulder and into his arm. He was awarded disability benefits from workers' compensation as well as medical benefits. He underwent numerous sessions of physical therapy and injections into his neck that provided some relief. Ultimatley, our office was able to secure a very good lump sum settlement. A slip and fall accident can also cause a cervial injury. If you are caused to fall by a defect or snow and ice and you strike the ground with your back or side, it can cause your neck to snap. This can result in a serious neck injury and lead to cervical radiculopathy. Also, a nasty fall down a defective set of stairs can also lead to a neck injury. It is very common to see these type of injuries in a slip and fall case. Treatment options for cervical radiculopathy vary, depending on the stage and severity of the injury. The treatment options for symptoms of cervical radiculopathy can range from rest to surgical intervention. Rest and Medication. Treatment for cervical radiculopathy in the initial phase is to stop all physical activity that may lead to further vertebrae damage. Rest and recuperation is the first approach to healing as well as non-steroidal anti-inflammatory drugs such as ibuprofen or over the counter drugs such as Advil and Aleve are the preferred initial treatment of these type injuries. Non-steroid anti-inflammatory drugs target pain and inflammation and since much of the pain is secondary to inflammation of the nerve root, a reduction in inflammation can be of great relief under certain circumstances. Opioid medication is used when other medication fails to provide adequate relief and in many cases it is the only form of relief to injury patients. We can tell you from the number of years we have been handling personal injury cases and car crashes that turning to opioid use long term can be a precarious option due to the risk of severe addiction. Physical Therapy. Physical therapy is used as a means to slowly increase movement and build up the neck muscles. Strengthening the muscles that support you spine and learning how to prevent future injuries is the philosophy behind physical therapy. Physical therapy starts off slow giving your body the opportunity to heal through a number of passive treatments such as deep tissue massage, hot and cold therapies, electrical nerve stimulation or ultrasound. Over time, though various exercises incorporated in treatment will improve your strength, core stability and range of motion. Epidural Steroid Injections. Cervical epidural steroids usually follow in a situation where there have not been a satisfactory response to physical therapy. There are many individuals that respond well to epidural steroids and there is sufficient evidence to suggest that it can provide both short and long term improvement for cervical radiculopathy. In situations where a car accident victim’s symptoms of cervical radiculopathy continue or get worse even after the nonsurgical treatment options above, surgery may be recommended. Surgery for cervical radiculopathy usually involves removing a part of the bone or tissue to help relieve pressure on the nerve. The main goal of surgery is to decompress the nerves in your neck that are compressed to help relieve the painful symptoms. Surgery also aims to improve neck pain, help with range of motion, and make the cervical spine more stable. Today there are minimally invasive surgery techniques that is changing the way neck surgeries are performed. Instead of one large incision, cutting through muscles, ligaments and tendons, minimally invasive surgery is accomplished through several small incisions. Using microscopic tools a surgeon can treat cervical radiculopathy through decompression and fusion. The benefits to the patient is a shorter hospital stay and shorter recovery time. Surgery should be considered very carefully and almost as a last result for cervical radiculopathy. While decompression of the nerve roots seems the logical means to reverse the condition, the type, location and severity of the disc issue must be considered in any surgical decision. As you can see, neck injuries from car accidents, slip and falls, or work injuries are very common. The neck is a delicate and vital part of the body that is susceptible to injury. If you injure your neck in a car crash or slip and fall due to someone else's negligence, then you may have the right ot file a claim to seek financial compensation. In Massachusetts, workers' compensation is available to an injured worker regardless of whose fault the accident was. Injuries to the cervical spine must be carefully handled in an injury claim. Insurance companies, their adjuster and lawyers usually look to see if the injured person had any preexisting injuries to the neck or degenerative changes to the cervical region. With life sometimes being as grueling as it is, it is not uncommon to see degenerative changes or medical evidence of a prior injury to the neck, especially as we age. It is important to know how to combat any argument by an insurance company that the neck injury is related to an accident. Also, this type of injury and the several treatment options, discussed above, can result in very expensive medical bills, significant time out of work, and severe pain and suffering. Cervical spine injuries can result in partial disability or, in more severe cases, permanent disability. This means that accident victims should be mindful about seeking compensation for their medical bills, lost wages, as well as compensation for possible future damages (i.e., lost earning capacity) and loss of function. An experienced personal injury attorney will know how to properly handle an injury claim for a severe neck injury and advise the accident victim about their rights. If you or someone you know has been involved in an accident and suffered a neck injury, including cervical radiculopathy, feel free to contact us or call (508) 879-3500. We offer free case evaluations and will explain to you your rights, options, and how we can help.